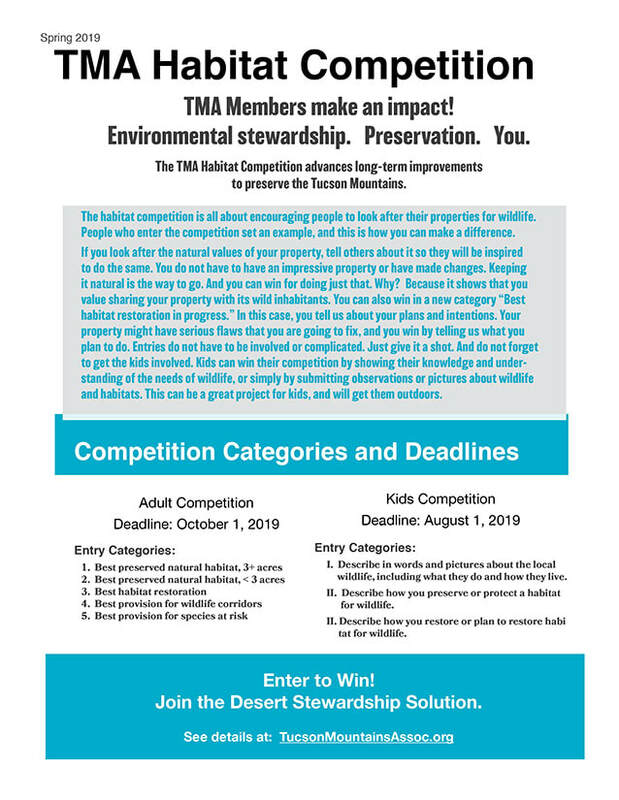 The habitat competition for 2019 is open. Think about it, just by entering the competition, you promote environmental conservation. Why? Because it makes the statement that you value the natural values of your property and encourages others to do the same. Tell us a little about your property, and send us some photos. You do not have to have a large or spectacular property. Any property on which the natural qualities have been preserved or restored is a valuable property from the point of view of the competition. Click the link below for the guidelines. The habitat competition for kids is open too. Encourage your kids to enter. There is no better way to promote environmental protection than to have young people involved. It can be a great activity for children, as it promotes independent learning and builds their confidence. Click the link below for the guidelines. ​Carolyn Leigh and Ron Perry have a 9.3 acre property on the corner of Speedway and Camino De Oeste. Apart from buildings on the property, they have kept it completely natural. Thus, it continues to function as wildlife habitat, and provides a critical wildlife corridor between protected areas, namely the Tucson Mountain Park and Feliz Paseos Park. It also feeds into the Camino De Oeste Wash, which continues to provide a corridor all the way to the Santa Cruz River. The Leigh-Perry property wins in two categories: Best Preserved Natural Habitat, and Best Provision for Wildlife Corridors. We are delighted to announce that the 2016 Habitat Competition drew several strong entries, and we are making three awards. John Dennis has a small property of 1.39 acres abutting the Sweetwater Preserve. Apart from his house and a small area around it, the property is completely natural with no species not local to the area. It is continuous with the Sweetwater Preserve and increases the Preserve’s effective area. Around John’s house, a few non local species have been planted, but not enough to significantly impair the habitat values of the property. John is the Winner of Best Preserved Natural Habitat, Properties Less than 3 Acres. Doug and Doris Evans have a lovely property of about one acre with a small wash running through it. They have wonderful photographs of visiting wildlife. Some significant nonlocal plantings have changed its character somewhat from the original condition, but the property continues to function well as habitat for the local species. Doug and Doris are the Runners Up for Best Preserved Natural Habitat, Properties Less than 3 Acres. Roger Carpenter’s property provides a vital connection between the Tucson Mountain Park and Feliz Paseos Park. His property has a broad natural area where wildlife can live and move between these two parks. His house and developed areas are to one side, and minimal, keeping this critical connection open. A small wash runs through the property connecting also to the very important Camino De Oeste Wash, which runs all the way to the Santa Cruz River. Roger’s sensitive stewardship of the property means that these vital habitat connections are secure. Roger is the Winner of Best Provision for Wildlife Corridors. Winners will receive plaques at our next TMA event, and runners up will receive certificates. It is great to see such pride in the natural values of our area along with sensitive stewardship to preserve our local ecosystems. Following these examples, we can live in the Tucson Mountains, enjoy them and keep them well. We have a winner for 2015: Tom Wiewandt for his property. Tom won in two categories: Best Preserved Natural Habitat, properties 3 acres and more, and BestProvision for Wildlife Corridors. Tom's property is a large almost completely natural parcel of land that critically connects the University of Arizona's Desert Station to the Sweetwater Preserve. Congratulations Tom! Tom's award will be presented at the annual meeting and picnic in October. Although it would be hard to beat Tom Wiewandt's entry, you do not have to in 2016, as Tom will not be eligible to enter his property again in the same categories. So maybe you can win this year. Do not worry if your property is big or small, or if its natural areas are extensive. Just show us how much you cherish the natural values of your property.